Catalan Take-over at the Castle Cafe. Chef Sessions Number Four! 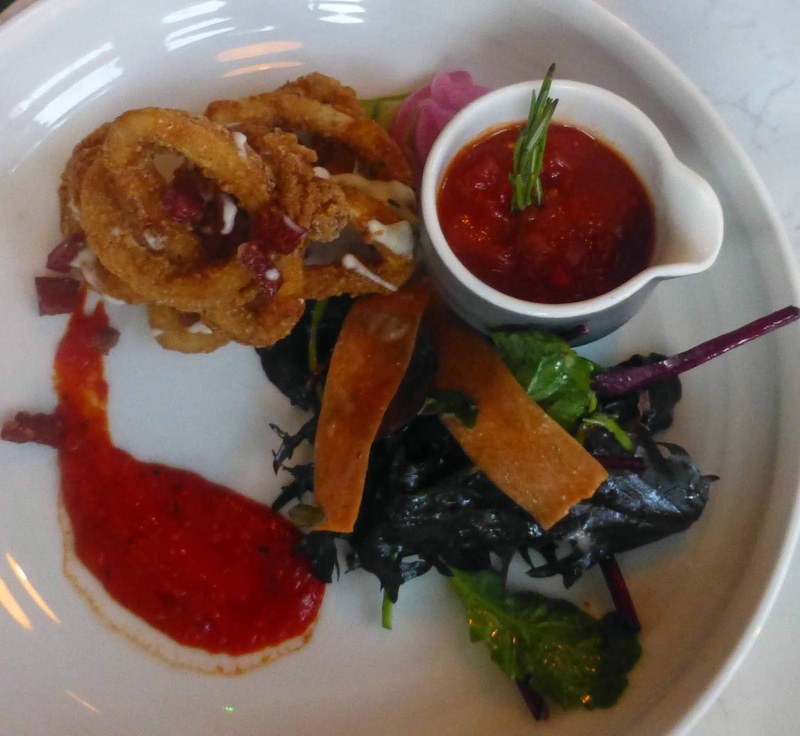 Every now and then the young chefs of the Market Lane group get a chance to shine. The latest came on Monday evening at the Castle Café at Blackrock Castle where, under guidance from Executive Chef Stephen Kehoe, Sara Movilla Cobo, Jose Emilio Escobar Garcia Prieto, Marc Montserrat Vila and Marc Oliveras Duran, cooked a Catalan meal for a full house. The four have become a core part of the team at the group (which also includes a micro brewery and city restaurants Elbow Lane, ORSO and Market Lane itself) as a result of the excellent recruitment programme that the group has had with CETT (Campus de Turisme, Hoteleria i Gastronomia) University in Barcelona since 2017. That full house included Market Lane’s Conrad Howard. He was excited as any of the guests as he welcomed us and looked forward to the evening, the fourth in what has become known as the Chef Sessions. Neither he nor we would be disappointed. We got off to a good start with a glass of Kir. Soon the breads were on that table and soon we were trying them. 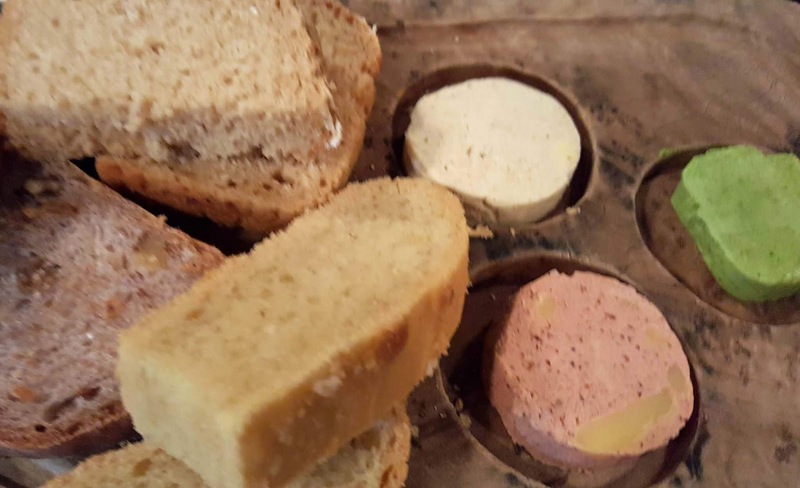 The selection of Spanish and Irish breads were accompanied by some lovely butters, one featuring beetroot, another garlic and kale, the third mushrooms. And they went down well with a glass of the Elbow Lane red ale. Next up was the Salmorejo, a cold tomato soup with olive oil. 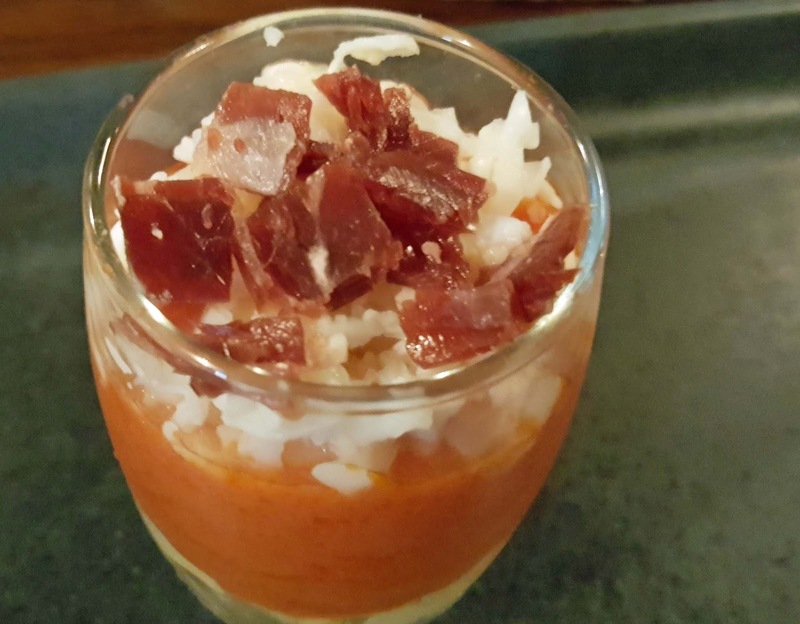 It was served with cured Spanish ham (on top) and a boiled egg (at bottom). 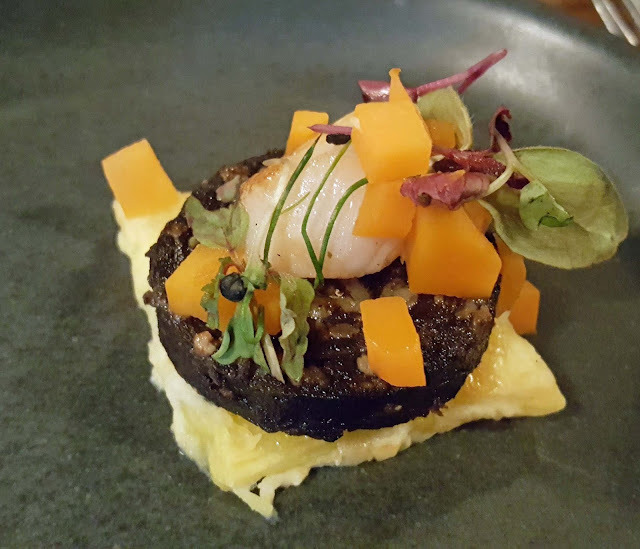 Enjoyed that and also the Black pudding, scallop and pickled carrot tapa. There were no less than five “units” in the next serving session. 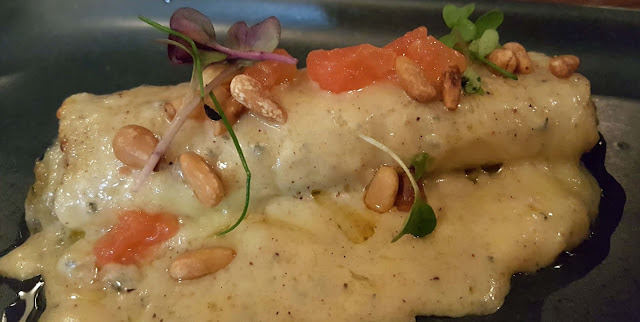 The highlight for me was perhaps the Courgette cannelloni with Cashel Blue cheese, a beautiful combination. The most unusual was the Kokotxas al Pil Pil. Kokotxas is goats neck in garlic oil, with an emulsion of olive oil and garlic and basil. 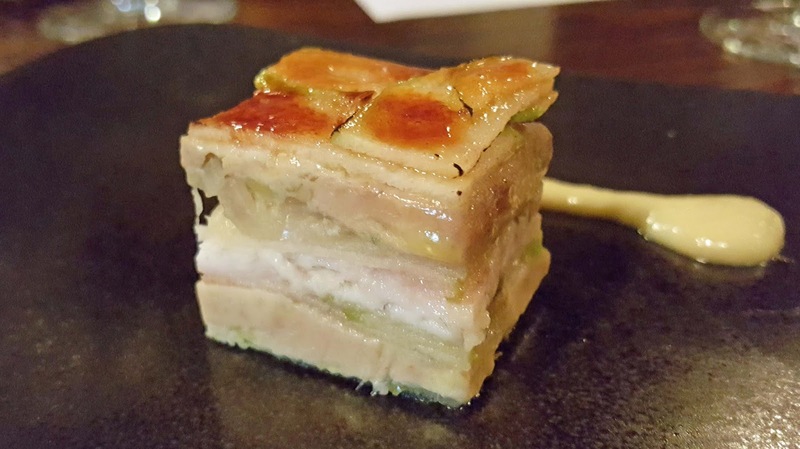 Also included was a cube of Foie Eel Apple, layers of eel and thinly cut apple with a caramelised top; a Croqueta de L’avia (traditional); and a Seafood Paella. All the while, we were sipping our wine, two organic gems imported by Le Caveau. The red Almate has been described as “as outstanding within its type and style” and it certainly lived up to the Spanish Wine Lover description. The white, Château Beauregard Mirouze Campana blanc from Corbieres, was aromatic, elegant and with a long finish. 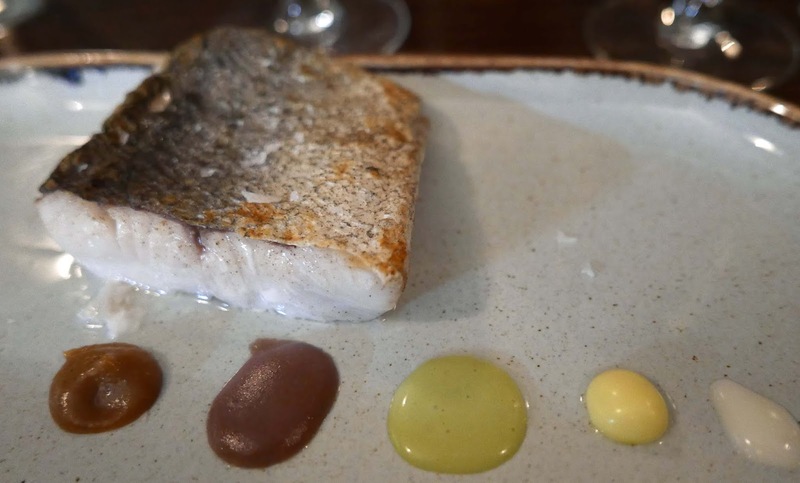 We were getting to the serious end of the evening now and our fish course was Hake with five sauces. I particularly liked it with the fennel. The meat was a well cooked piece of pigeon, served with pack choi and pear. Getting full now! But dessert was on the way and a nice one it was as you can see by the top photo. And then there was a selection of petit fours to sample: a Hazelnut Financier, Bailey’s Bombon, and a Panellet. The latter is the traditional dessert of Catalunya. I think with all the delicious food displayed by the chefs at the Castle, a move to the north east of Spain would be no hardship at all. Meanwhile, we can all look out for the Spanish influence on the menus of the Market Lane group. Cork Cheese Fair. Amazing New Cheeses. 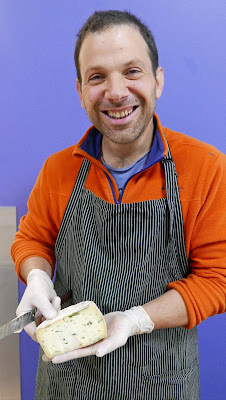 Many of you will know of Vincenzo, the Italian shepherd best known for his Pecorino which is on sale at the Toons Bridge Market stalls.That was his first cheese here in Ireland but he has quite a variety now including a stunning new one called Conciato Romano. While there were quite a few old favourites, such as the classic Coolea and the outstanding St Tola, showing at the weekend’s Cork Cheese Fair in Cork Airport, there were quite a few new or at least relatively new ones, including Vincenzo’s, Cashel Blue’s Organic version, the aromatic Italian Truffle Cheese from Carrigaline Farmhouse, Rockfield (a hard sheeps cheese from Velvet Cloud of Claremorris) and Hegarty’s Templegall. The Little Milk Company also had a beautiful Mild Organic Irish Cheddar. Jessica told me it is flying in Germany and Denmark and should be on the home market soon - so watch out for that! The Conciato Romano is an ancient Italian cheese, indeed many believe it is the country’s oldest, and its production is being encouraged by the Italian Slow Food Foundation. Vincenzo’s is made from sheeps milk but goats or cows may also be used. After being pressed by hand the forms are cured and dressed with olive oil and vinegar and herbs before being packed in a sealed jar (or amphora) and matured. “It sells well in the markets,” he told me and, for the moment, you’ll probably have to travel to Skibbereen where he has a stall every Saturday to get it (and his other very interesting variations). Always a fair bit of variety in the Carrigaline Cheese portfolio and now there’s a new one, an Italian Summer Truffle. “A small piece goes a long way,” says producer Padraig O’Farrell who is delighted with the way it has turned out. For the moment, you cannot buy it in the shops but watch out for it in restaurants (it is available to chefs via Pallas Foods). Reckon there will be some beautifully aromatic dishes created using this one! 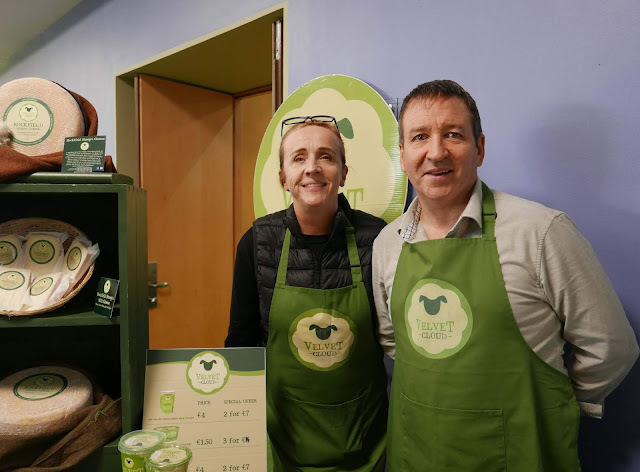 Aisling and Michael (above), the duo behind Mayo’s Velvet Cloud, have become well-known because of their yogurts but now their Rockfield cheese is getting very popular as we found out during the Cheese Dinner that preceded the fair. It is creamy and buttery in the mouth with slightly sweet and nutty undertones. The cream coloured interior of this cheese becomes firmer and darker as the maturing period is extended and the flavour becomes nuttier. Supply of this lovely new product is fairly limited this year and Cork buyers can find it in On the Pigs Back. Should be more of it available next year and probably more stockists as well. 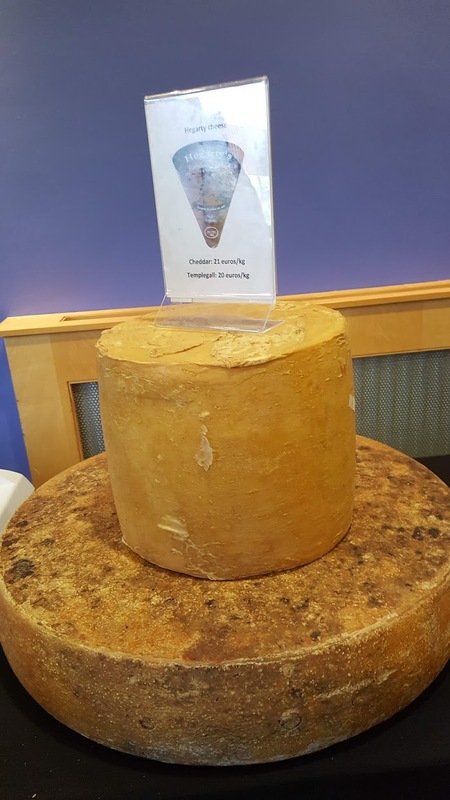 Hegarty’s Templegall comes in a big wheel and is a gorgeous delicious Comté style cheese. Dan Hegarty and Jean-Baptise Enjelvin (from Bordeaux but very much enjoying the “craic” in Cork) are rightly proud of this magnificent effort from the Hegarty’s Whitechurch farm. It has been earning plaudits for the past few months. It is available in cheese shops such as On the Pigs Back and you’ll also come across it in restaurants. And don’t forget that Hegarty's are famous for their cheddars. 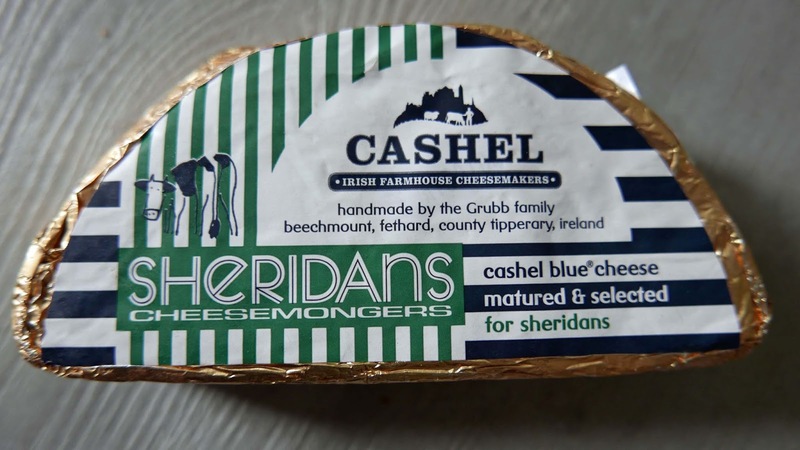 Cashel Blue is also very famous and their newish Cashel Blue organic is a another gem. “More mature than the original,” PJ Ryan told me on Saturday. “More of a hit to it but the same creaminess.” You can get this in cheese shops, including Iago. Also tasted their lesser known Shepherd’s Store, a traditional, European style semi-hard cheese. As a seasonal product, it is made only between the months of February and September, and is aged for a minimum of six months. Try it out at On the Pigs Back. Cork Cheese Dinner. Amazing Variety of Irish Cheese. Amazing Variety of Irish Cheese. We are used to the cheese course at the end of the meal. 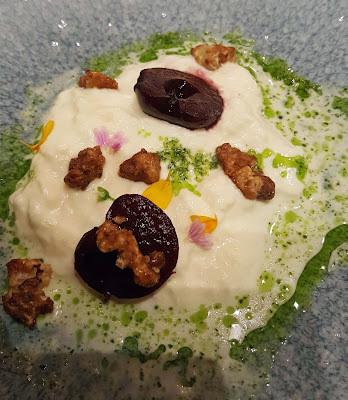 But this one came at the end of a meal in Olivo, the restaurant at the Cork Airport Hotel, the host venue for the inaugural Cork Cheese Week, a meal in which all the previous four courses had been based on cheese. Were we stuffed? No. Our four local chefs got the quality and the quantity just right and we enjoyed a delightful meal that brilliantly illustrated the variety of texture and flavour available in Irish cheese today. Delighted too to share this meal with Helene Willems. Helene with her husband Dicky were among the pioneering Irish cheesemakers, setting up in Coolea about 40 years ago. Now the second generation carry on the business at the same high standard, leaving Helene and Dicky plenty of time to enjoy life on the road in their beloved camper-van! Appropriate that Helene was with us at the Gouda table! 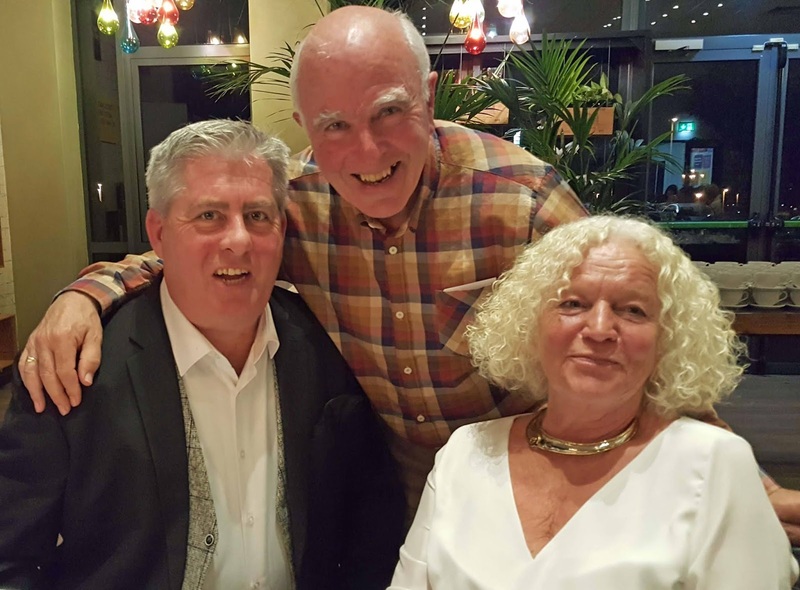 As was another superb Cork cheesemaker Padraig O’Farrell of Carrigaline Farmhouse whose mother and father started their cheese-making business over 30 years ago. The innovative Toons Bridge Dairy featured in our Amuse Bouche, a delicious Stracciatella with picked cherries and candied walnuts by Fran Jara who has just completed a six month course at the famous Basque Culinary Centre in San Sebastian, “well worth every cent,” she told me as we sipped some lovely bubbles as the guests gathered. Quite a few were associating cheese meals and heaviness but the opposite was the case with our lovely starter by Kate Lawlor, a soft and delicious Twice Baked Bluebell Falls goats cheese soufflé with a Hegarty’s Cheddar glaze with beetroot carpaccio. Pam Kelly’s main course was naturally more substantial, quite a tour de force actually. The Gubbeen pork was the star of the plate of course which also featured Coolea and Rockfield (sheep) cheeses with an excellent apple and parsnip sauce. 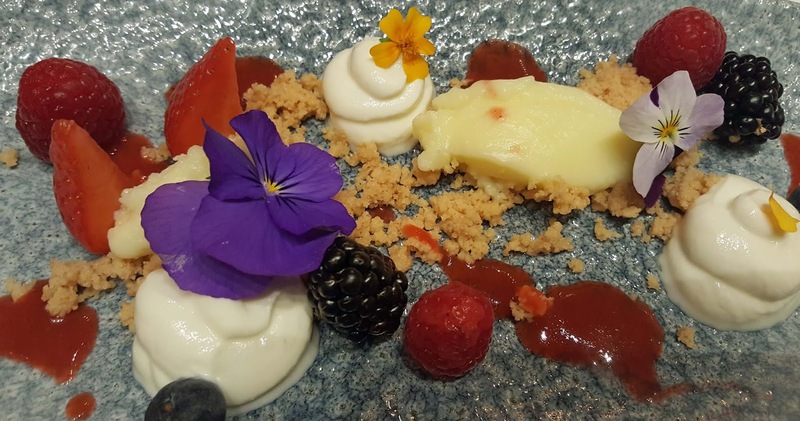 Our chefs were rocking it and the dance continued with a flower bedecked dessert from pastry ace Christine Girault, now dividing her time between Cork and Paris. Her “tarte aux fruits” looked well and tasted even better. 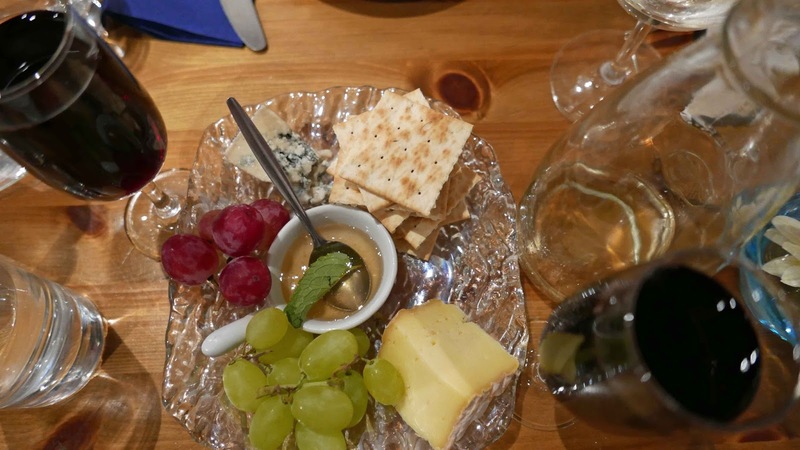 By now, the generous servings of wine were being replaced by coffee though not before we sampled the cheese board with Coolea, Cashel Blue, Carrigaline, Hegarty’s Smoked Cheddar and Gubbeen all featuring. And the hotel continued to spoil us with a selection of petit fours! 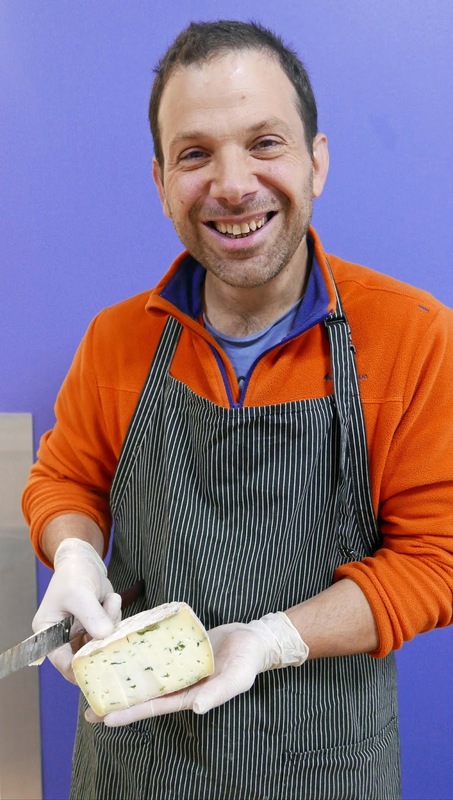 Quite a night ahead of two working days for the cheese makers as they were due to meet the punters for tastings and workshops on today Saturday and Sunday, starting at 11.00am each day. Details here. 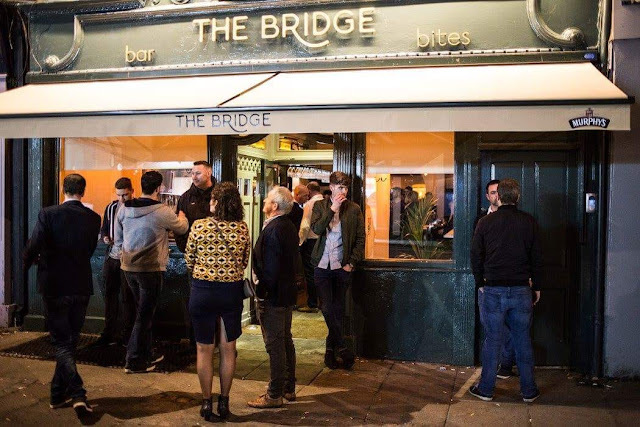 The Bridge Bar. Fine Wine, Craft Beer, Top Spirits, Tasty Food, Music. It is the last day of August and very wet as we reach Bridge Street in Cork’s Victorian Quarter. We didn’t complain too much about the rain after such a fine summer - remembering that we were praying for it a few weeks back. In any case, we were going indoors, into the warm and snug Bridge Bar. Here, a few yards from Patrick Bridge, they serve fine wines, classic cocktails, craft beers and some really cracking gins (including quite a few Irish ones). They also do a great pre theatre offer of a bottle of wine with a sharing board of light bites for two for €25 which is well worth a try judging by our experience. And if it’s just a drink you want then this long and narrow bar is perfectly situated if you’d fancy a drink before or after the show at the nearby Everyman or when dining on McCurtain Street. 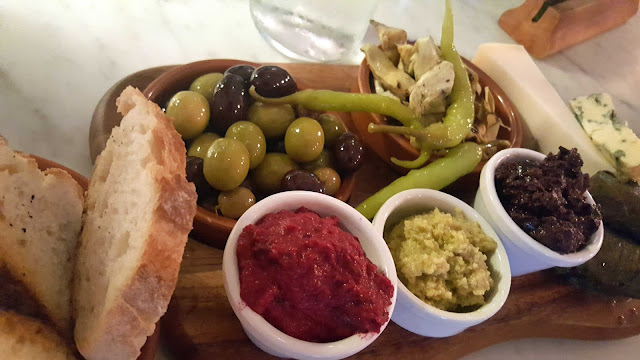 They also do a great Aperitivo & Nibbles, available Monday to Saturday 5 - 7pm. Enjoy two Gin & Tonics or Aperol Spritz with nibbles for €12. 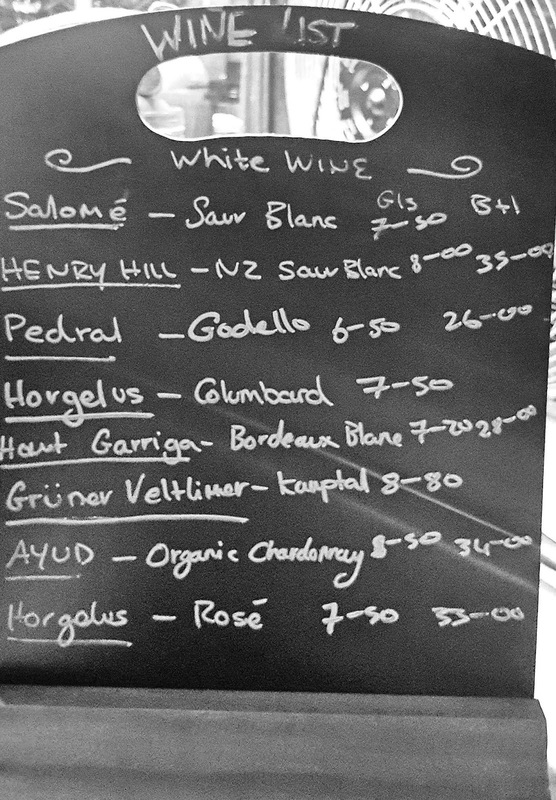 When we were seated at the bar, we had a quick look at the wines on offer, quite a few very tempting indeed. The Spanish Ayud Chardonnay is unoaked and organic and, on the red side, I spotted the delicious Samurai Shiraz from Australia. But beer won out in the end. 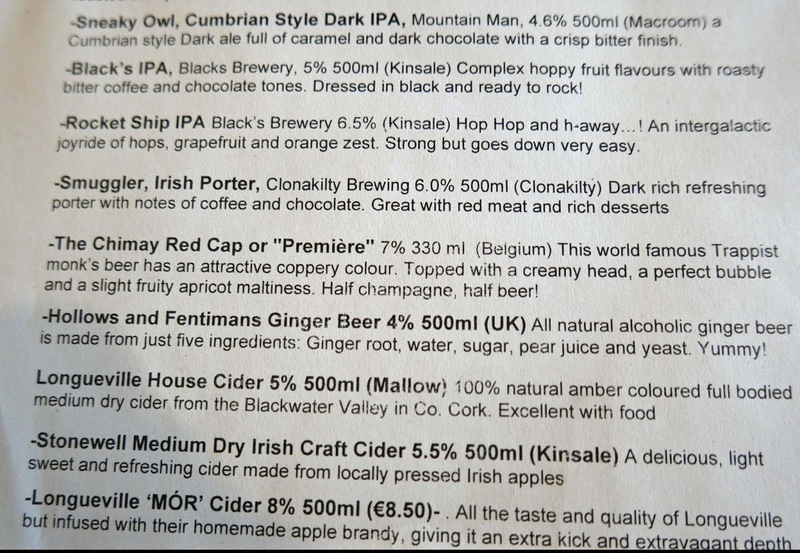 They have the usual main stream beers and also quite an array of craft beer on tap as well including Blacks of Kinsale, Yellow Belly, Kinnegar, White Hag, and Franciscan Well. And more keep coming according to manager Gavin. 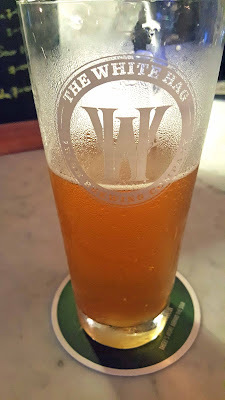 We enjoyed the Kinsale Pale Ale and also the Ale from Sligo’s White Hag. In the meantime, we had a look at the food board. They have Valencia Salted Almonds and Olives Marinated in Chili with Thyme and Garlic as nibbles. There’s a very tempting meat and cheese board for sharing for €15.00. The value is excellent here as we found out when we shared the Antipasto Board with cheese and no shortage of bread. The cheeses were Coolea and Cashel Blue and came with lots of little bowls including three tasty dips/spreads (including a beetroot hummus), a dish of artichoke hearts, a fine mix of marinated olives and a few other bits and pieces, all for a tenner! Top class stuff, as you can see by the cheese offerings, very tasty indeed and amazing value. We were in early on Friday and the place gradually began to fill. Back in the spring of the year, we called in there much later in the evening and the Bridge was packed, great craic, and music playing. The Bridge is now heading into its second winter here and the frequency of live music events will increase as the daylight decreases. You’ll also see they do talks on everything from whiskey, to local foods and Big Sporting events on the large screen too. Handy spot too for a party. Indeed there is a free White Hag beer tasting on this evening. 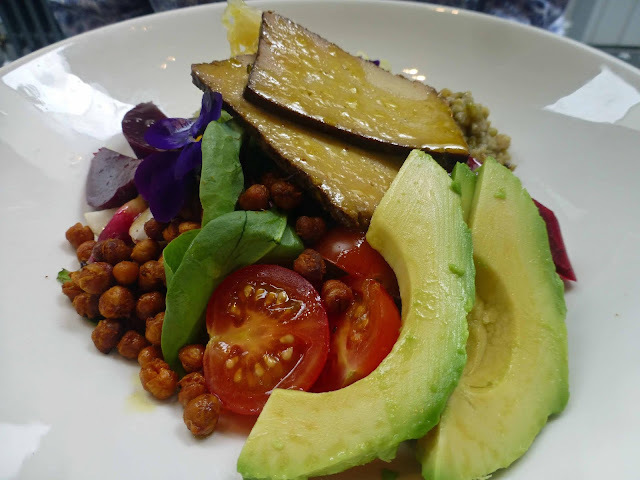 Check them all out on Facebook @thebridgecork and Twitter @thebridgecork. Cork’s SpitJack. Making A Difference on Washington Street. Making A Difference on Washington Street. 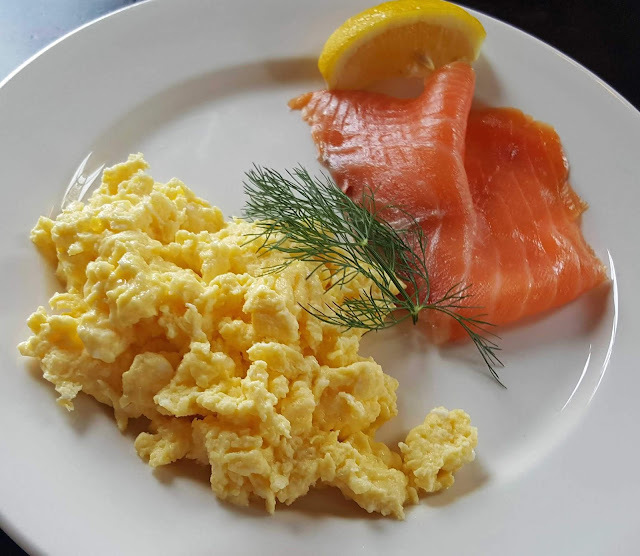 When you’d like something that little bit different, for breakfast, lunch or dinner, then head to the SpitJack on Washington Street. Number 34 is a lovely old building the food (based on local produce and generally given the rotisserie treatment) is excellent and the staff are very helpful and friendly. There were four of us in for dinner the other evening and we absolutely enjoyed the buzz - the place was full - the ambiance and the food. 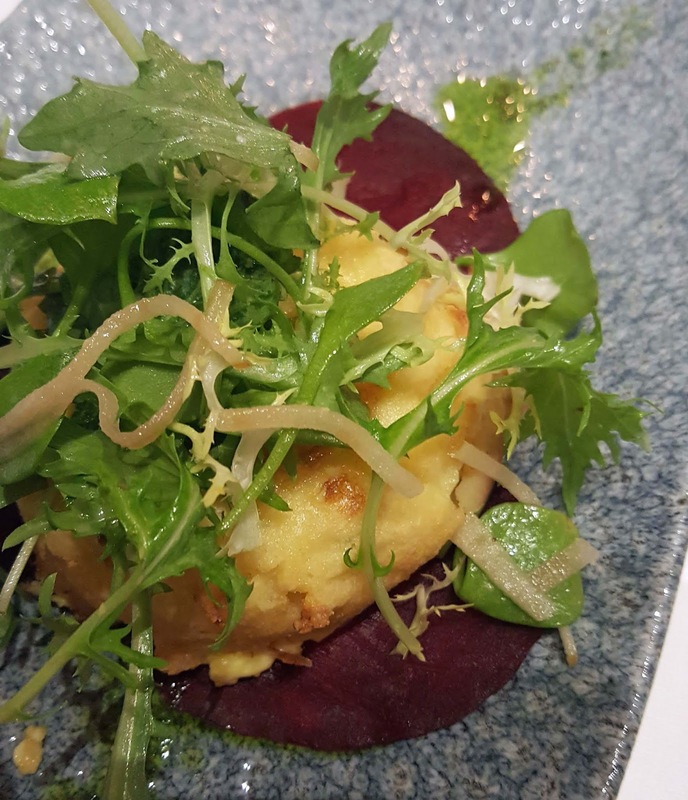 The expertise of the team and quality of the food combine to make the lovingly restored old venue conducive to enjoying a good night out in comfort. And the drink. They have much to offer here, including spirits galore and a tempting cocktail list. 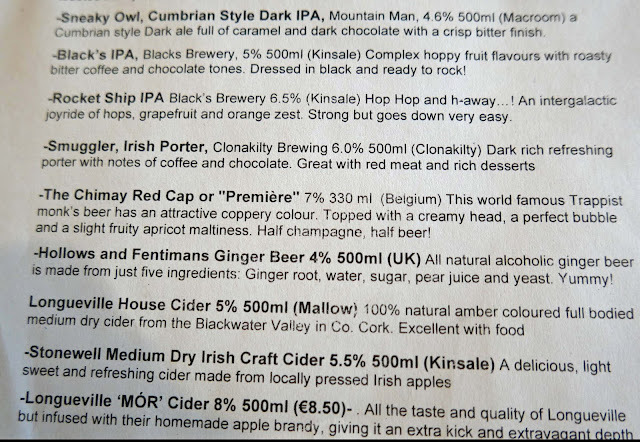 One of us enjoyed the smooth 8 Degrees Knockmealdown Irish Stout (5.0% Abv) 5.5 with its espresso and molasses aromas. The rest shared a mouth-watering bottle of Abadia do Seixo Albarino (32.00). Choices made and starters delivered. Lets begin. 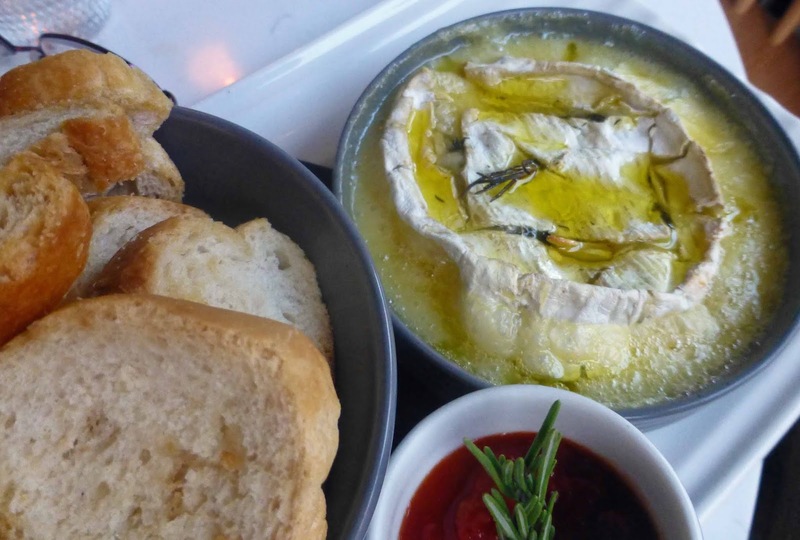 A pair of us shared the Rotisserie Melted Camembert (€15). This was studded with Rosemary and Garlic and came with Crusty Bread, Chilli & Tomato Jam. Quite a plateful and none went back. A lovely dish and not often seen in these parts. Sounds of approval too from the others. 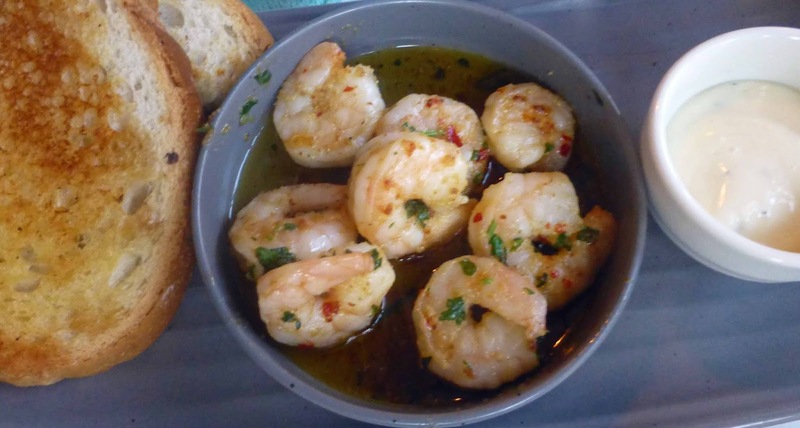 The Ballycotton Prawn Pil Pil (€9.90 ), a dish of Chilli & Garlic Prawns, Warm Country Baguette, Allioli, was highly ranked as one of the best of its kind and the same rating was garnered by the Ballycotton Crispy Calamari (€8.50) tossed in Home Made Allioli, with Sautéed Chorizo, Red Pepper Coulis, Mixed Leaves. One of a couple at a nearby table were celebrating a birthday and the staff joined in with a little cake and a song so we helped with the chorus and the applause. The main event followed and two decided on the Ballycotton Pan Roasted Hake with Butter Bean, Chorizo & Kale Broth, Shaved Asparagus, Fennel & Radish Salad, Potato Mousseline (18.50). Both were well pleased, each remarking on the flavoursome broth. Another winner from the kitchen. Ballycotton was doing well too and everything from there went down well at our table. Back to the rotisserie for my friend who gleefully demolished the Big Jack Burger, a North Co. Cork Aged Striploin Beef Burger, Cashel Blue Cheese, Baby Gem, Home-Made Pickles, The SpitJack Relish, Brioche Bun (€16.95). By the way, she asked for it without the bun. I could understand that, as most of the time, I usually eat just one half of it. Meanwhile, I was tucking into a dish that was that little bit different, the confit and Rotisserie Roasted Duck Leg Salad with Pearl Couscous, Roasted Sweet Potato, Red Onion, Carrot, Mixed Leaves, Tarragon and Orange Dressing (€17.95). Must say I loved it, every little bit. Sheridan’s get the credit for our current Taste of the Week. 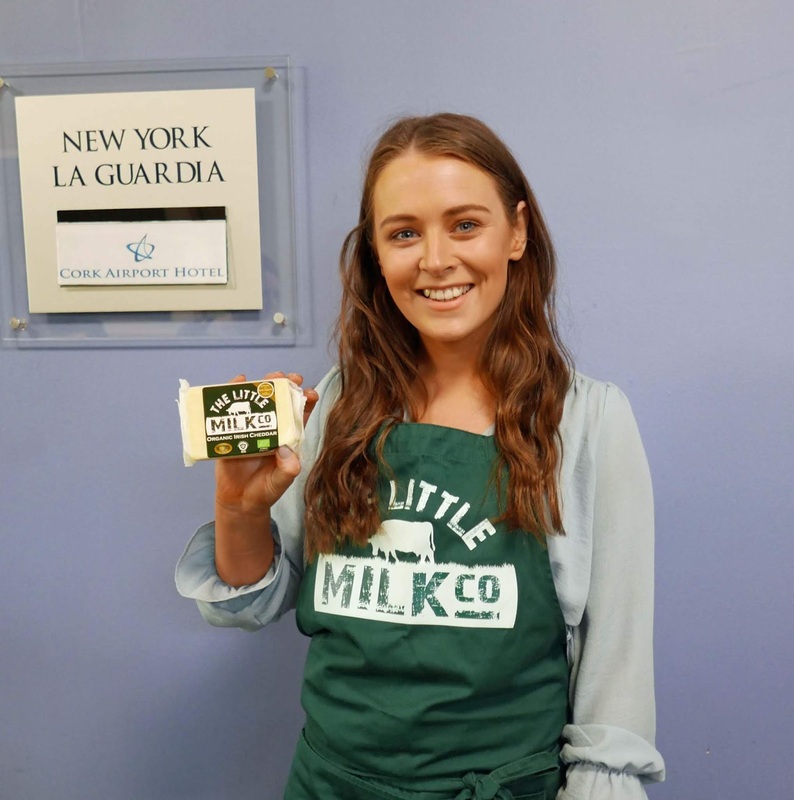 It’s a double and features one product bought in their Galway store during a recent visit to the City of the Tribes and another product bought in Bradley’s of Cork but distributed by Sheridan’s. The product from Bradley’s is a semi-circle of Cashel Blue made, as always, by the Grubb family in Tipperary, but selected, matured and distributed by Sheridan’s. So there I was one lunchtime with that Cashel Blue at hand and wondering how I’d enhance it. And then I remembered being served Black Cherry jam with sheep’s cheese in the Basque Country. 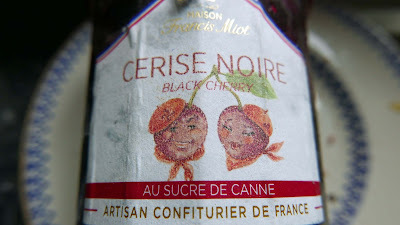 I had the very thing in the cupboard: a big pot of artisan made Confiture Cerise Noire (my purchase from Sheridan's). A perfect pairing and a delicious Taste of the Week. Lots of that jam left, so it looks as if I’ll be heading to Bradley’s for more cheese. Indeed, I may well also keep an eye out for that new hard sheeps cheese by Velvet Cloud. 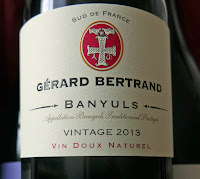 By the way, I also found another match for the cheese, a bottle of Gerard Bertrand’s Banyuls Vin Doux Naturel (from O’Brien’s Wine). Not the whole bottle, mind you, a little sip will do! Looking for a sure thing? Mikey Ryan’s has the answer. On the M8 and feeling peckish? Call in to Mikey Ryan’s in Cashel and they’ll sort that out for you. They have a lovely outside area at the back but the glass lined interior restaurant is also bright, not least because of a series of skylights. Lots of horsey pictures around here too and, if you keep your ears open, you might well pick up a tip and cover the cost of your nosh. Just thought I’d let you know. Because if you are strolling down the main street, you wouldn’t give tuppence (about 2.5 cent) for it. Not that it looks dowdy; far from it, but the exterior does look like a thousand other pubs in Ireland. Inside is where the magic happens and you’ll see it at work as you pass the kitchen area on the way to your table. We got there for lunch recently and thought we’d start with a few nibbles. 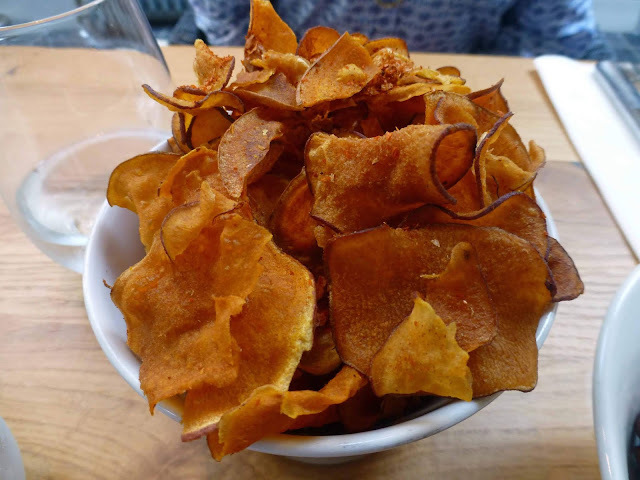 The Sweet Potato Crisps with smoked chili salt and the Mixed Olives would fit that bill, we thought. Portions are generous in Tipp. If the quantity was up then so too was the quality. A very enjoyable start! Our main courses were arriving now. CL went for The Nourish Bowl, one of a few dishes that comes in two sizes. Colours, flavours, and crunch galore in this mixed salad of spiced chickpeas, smashed avocados, herb tofu, pickled beets and sauerkraut. No holding her back after that. 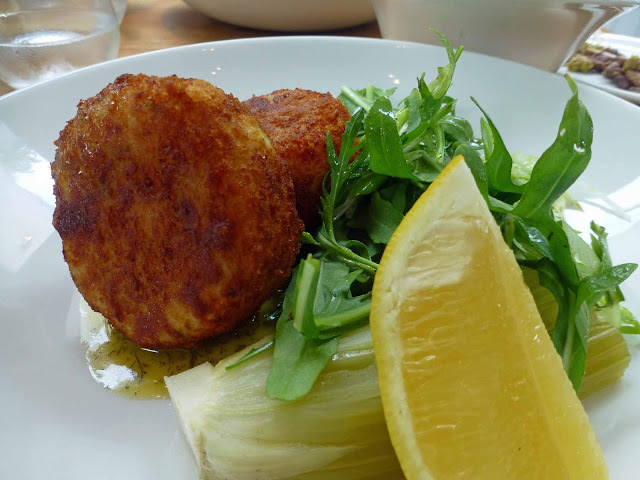 I was well pleased too after my Castletownbere crab cakes served with wild rocket and celery heart salad with lemon and dill dressing. Enjoyed the textures and the flavours there and, yes, there was no shortage of crab meat. Spotted a White Gypsy tap in the bar on the way in. They also serve the local Tipperary whiskey, Bertha’s Revenge gin and Kalak vodka (another local drink). In the garden, you may order your drink, including cocktails, from the Horse Box Bar (it is a horse box). 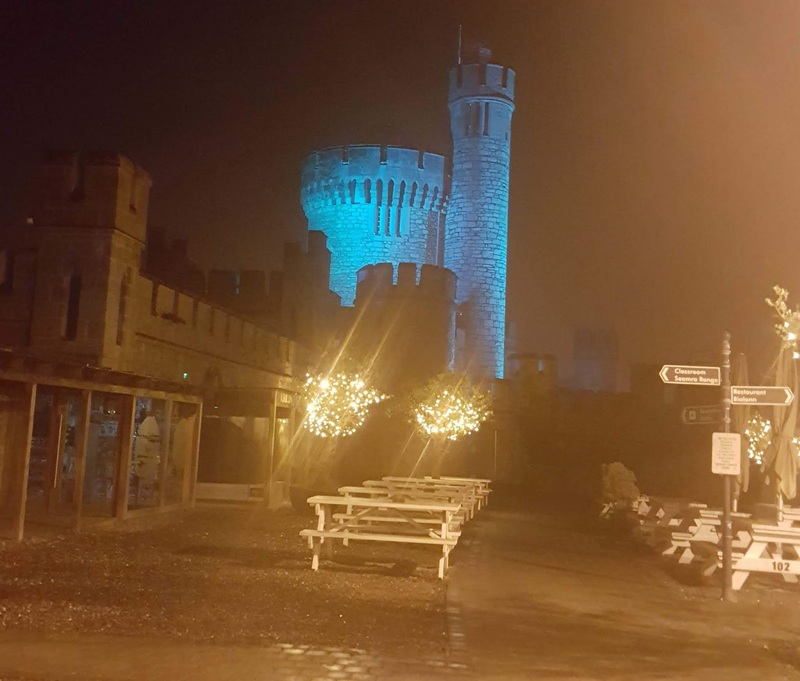 Artisan food producers are also supported here and you’ll see Toons Bridge, Cashel Blue, Galtee Honey, Gubbeen, KIllenure Castle (dexter), The Good Herdsmen, Annie’s Organic Farm and Comfrey Cottage Cashel among those mentioned. 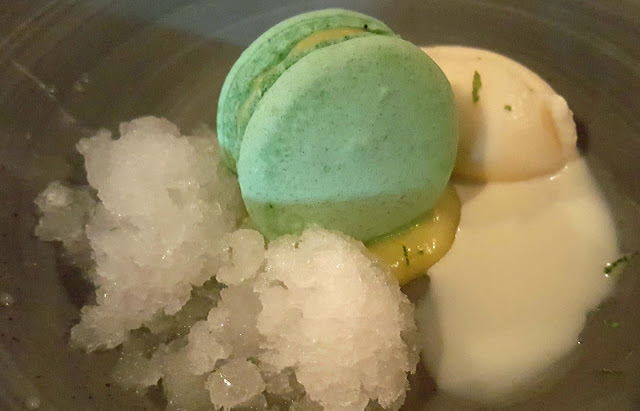 Reflecting the food philosophy of Chef Liam Kirwin, the menu “is founded on the culinary principles of freshness, seasonality and a focus on quality ingredients prepared with care”. My kind of restaurant and very highly recommended. * Do check out the toilets, they are high class, as good as you’ll get in a five star hotel. And keep listening for those racing tips! A country classic, for sure. (McKenna’s). 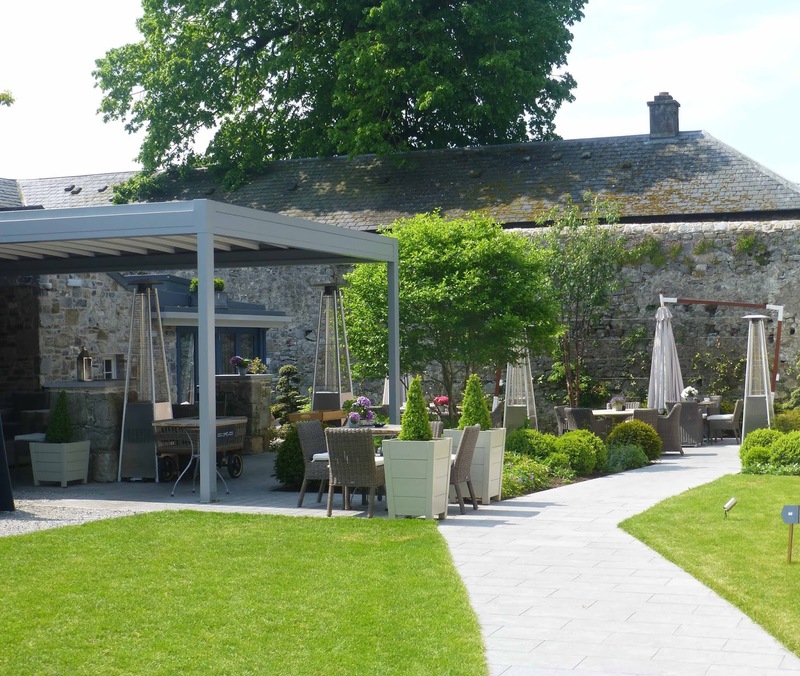 Those in the know happily take a drive out from Kinsale and Cork city to enjoy Michelle O'Mahony and Gavin Moore’s lovely restaurant. 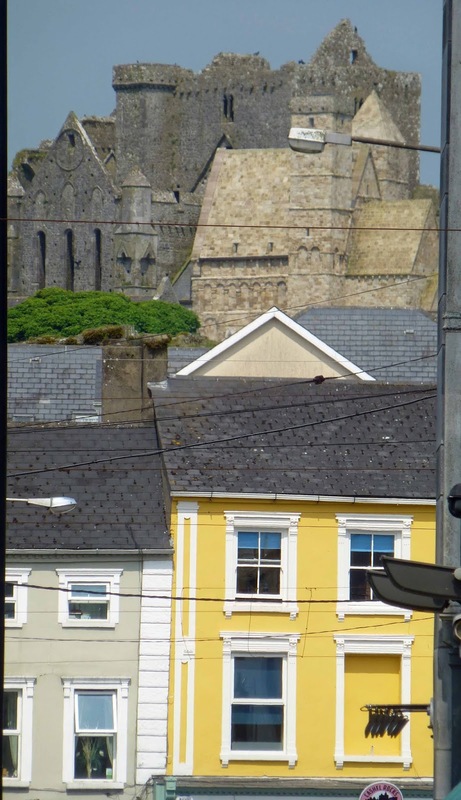 (Georgina’s Campbell’s Ireland Guide). I have seen the future and it’s in Timoleague. 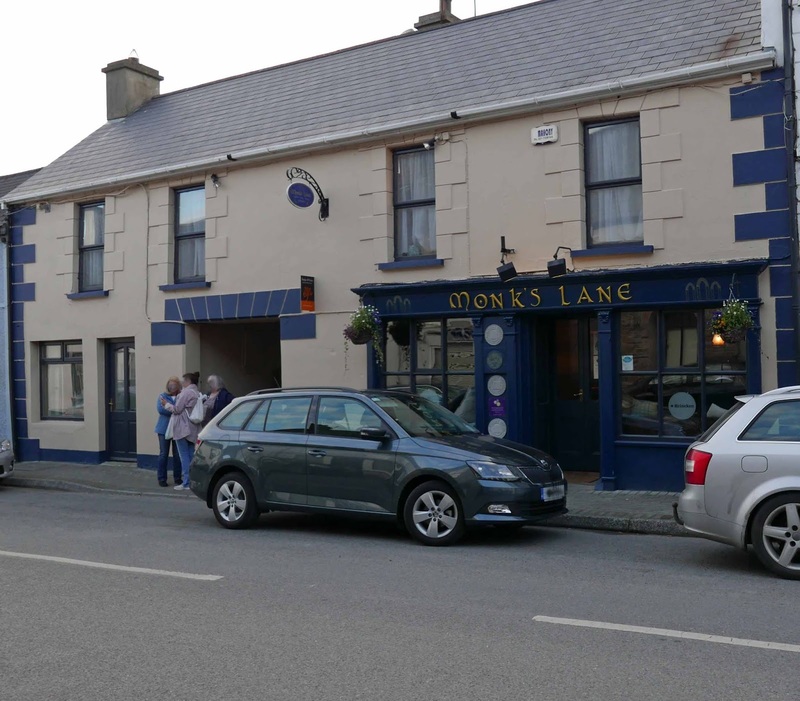 This is a pub that manages to be utterly unpretentious but which also ticks every conceivable box.. (Irish Mail). Most of you know by now that Monk’s Lane, a gastro-pub in Timoleague, is a must visit. But did you know, that across the lane, they now have a Gin Bar and a private dining area. And, indeed, in the lane itself, there is a beer garden, part of it covered, an inviting summertime venue. Just some of the good beer (and cider) available here. That Gin Bar is well endowed and serving a long list of Irish and English gins. The Irish list is as long as your arm, the English almost as long as the other one. And another distinguishing factor here, since they opened, is the craft beer menu. No messing here with a token bottle or two. Quite a few by draught and even more by bottle. We were there the other night and I enjoyed Roaring Ruby Red Ale by the West Cork Brewery, one of the best red ales I've come across, fantastic body and flavour all the way from Baltimore (not too far really!). CL's pick was the Black's 1601 lager. Here too you may have an aperitif, White Port and tonic for instance. 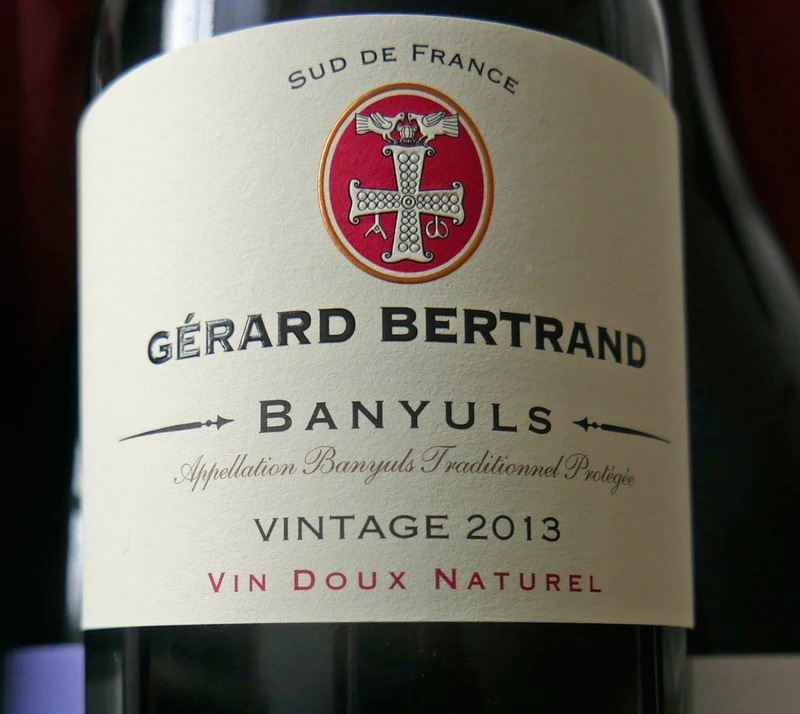 Wine of the Week perhaps? A white from Italy, from Puglia, a Garnacha from Navarra. And there are three cocktails on offer: based Black’s of Kinsale gin, a Longueville Mór Martini and a Gunpowder Gin du Jour. Wines, by the way, come in five different sized servings, starting with a convenient 100ml. You'd never know by these opening paragraphs but we did come here for the food and glad to say it is as varied and as good as ever, local produce well cared for, well cooked and neatly presented and delivered to the table with care and a smile. And at a fair price too. So let us start! 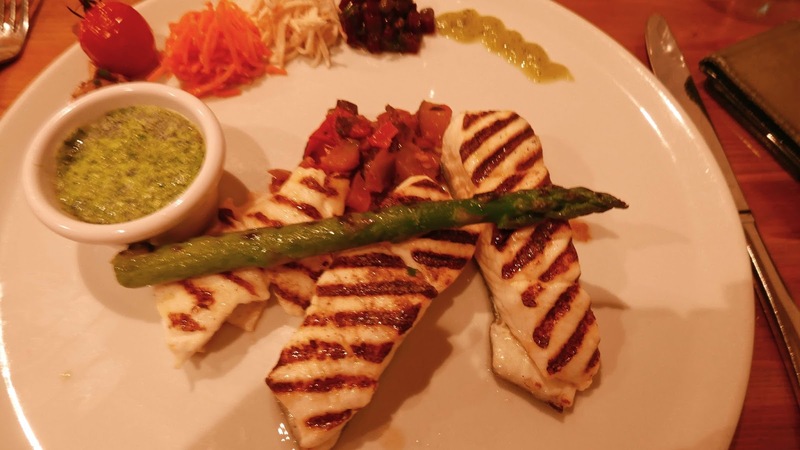 There are eight or nine starters to choose from and also a trio of sharing plates, virtually all featuring local produce. 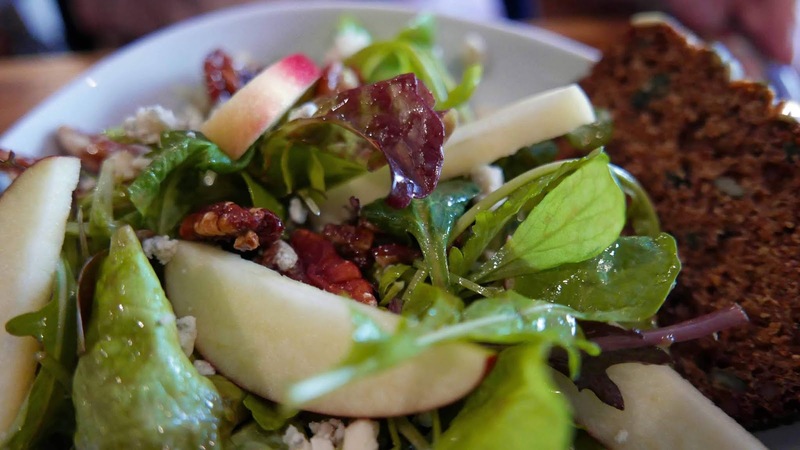 CL picked the Crozier Blue, apple and candied pecan salad. Hard to go wrong with that combination and it was superb, that creamy blue, those delicious nuts. Mine was a bit more exotic: Lamb Quesadillas, with salsa fresca, salad and lime yogurt. That, with a couple of dips, one cooling, made the taste buds sit up and take notice! 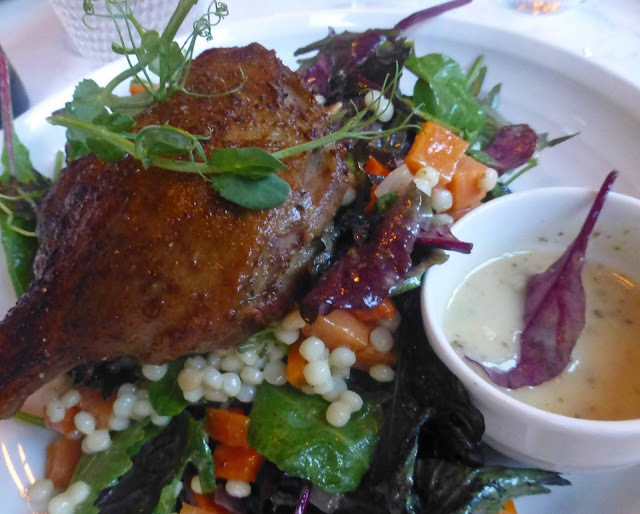 Have to say too that the salad leaves in both starters were as fresh as could be and well dressed, simple stuff, simply well done. By the way, each of these starters was also available in a large size. On then to the mains and again we were picking from a good long list, everything from Haddock Fish and Chips, to Sea Trout, to 10 ounce sirloin. 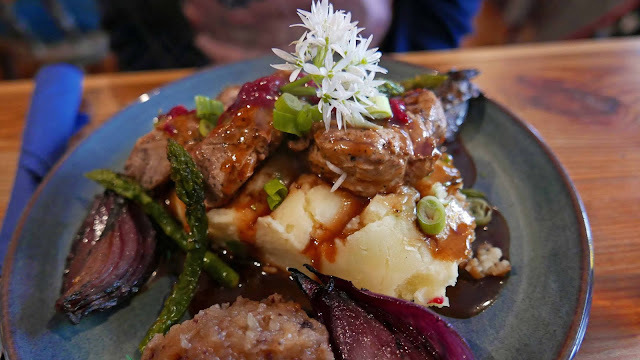 Garlic and Thyme Marinated Pork Medallions (17.95) was one of our picks and it was served with spring onion mash, char-grilled red onions, apple and raisin chutney and a cranberry gravy. Silence reigned while that was being demolished! I wasn't doing too much talking myself either as I made my way through quite a delightful plateful: Chorizo and Rosemary Infused Wagyu Beef Burger (18.50) , on a flour bun, topped with melted buffalo mozzarella, homemade aioli, tomato chutney, sautéed onions, hand-cut chips and salad. Some wild garlic in there too. All good, the beef outstanding, loved the chutney, the chips of course and again that salad played a key role providing colour, flavour and crunch. Be sure and check out the lane to the left! We were feeling fairly full at this point and dessert was being turned down until we were “persuaded” to share the Rhubarb and Ginger Cake with ice-cream and cream. It didn't last long, the ginger adding a certain “je ne sais quoi” to the combination! Just goes to show that one ingredient can lift and distinguish a dish. We had seen it earlier with the chorizo in the burger, the candied pecan with the cheese. Get the big things right and use something small to make the difference. Looks like they do that here a lot. Worth a trip not to mind a detour. The Lifeboat Inn in Courtmacsherry is not open a year yet but is making quite an impression in the village. 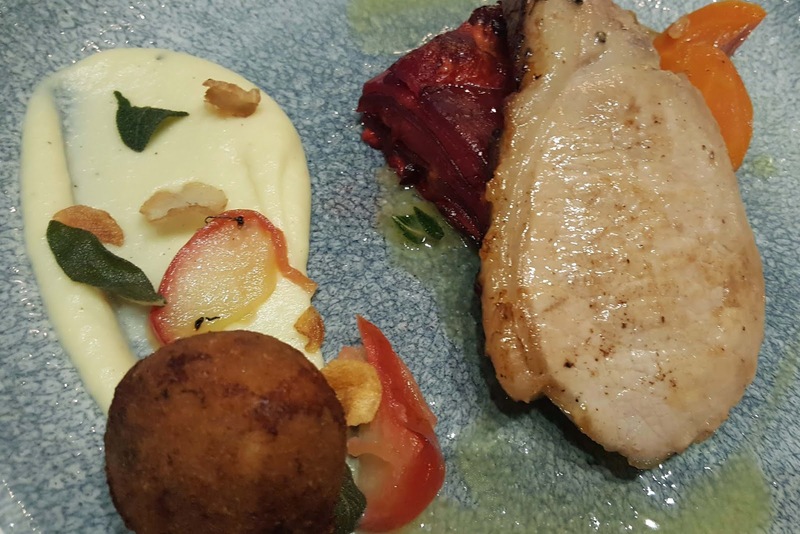 Serving good local food, much of it from the nearby waters, in a casual atmosphere has been the aim of David O’Halloran and chef Martin Buckley since they started here last summer and already it is paying off for them. Indeed, they have “expanded” across the road where an inviting terrace has been set up with views over the water. I reckon that will be buzzing in the months ahead. So, a tip for motorists: drive slowly here and allow that server (it may well be David as he looks after front of house) get across the road! We were there recently and the menu , as promised, has lots of fish and seafood: cod, black sole, John Dory, crab claws and prawns. And quite a bit more as well. The menu is short enough but I prefer to see a short list and high quality, and that's what you get here. 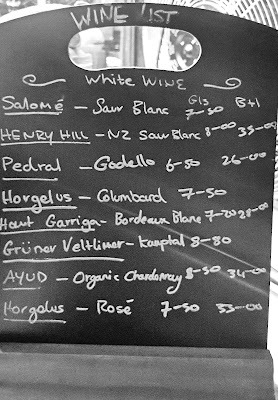 Surprisingly enough, the wine list is a long one with lots of choice. The outstanding Craggy Range Te Muna Sauvignon Blanc features but the New Zealand wine is one of just a few from the New World. We enjoyed the Tandem Wines Casual Rosé and an Albarino, both from Spain, two of about ten whites available by the glass. A few more from the New World in the reds, where I spotted the lovely Finca Florencia Malbec from Argentina; some excellent European offerings too, ranging from 22 euro to 130. And there is a bar right there in the middle offering the usual suspects plus an outstanding local craft beer by Blacks of Kinsale. 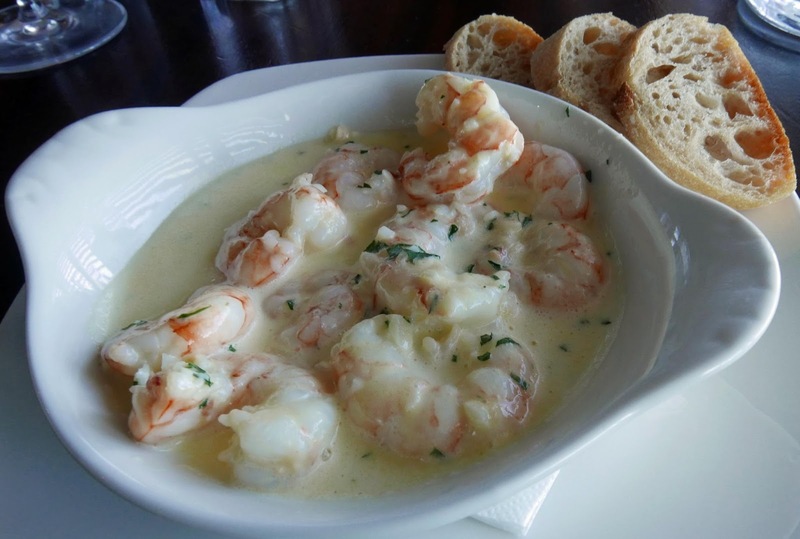 We had five starters to choose from and my choice was their Prawns in garlic and white cream with crispy sourdough on the side to soak up the cream. A simple enough dish, delicate and delicious and pleasurably dispatched. 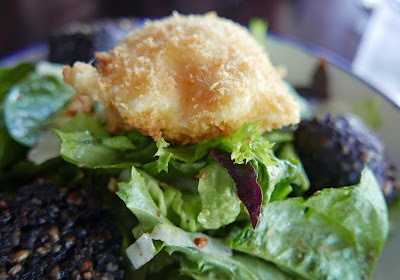 CL’s opener had more texture, more flavours, also a little bit more robust, and the warm Haulie’s Black-pudding salad served with apple, walnut and crispy hen’s egg was also a winner. 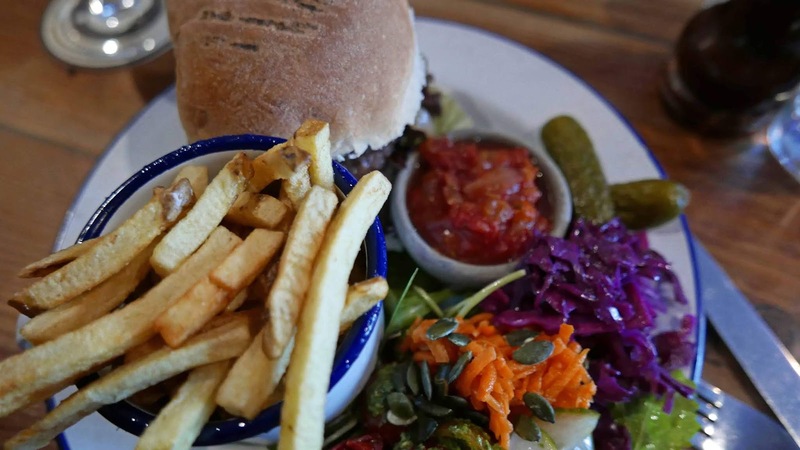 Aside from the fish dishes, the mains may also include a Beef Burger in a Brioche Bun with Gubbeen Cheese and Tomato or a Sirloin Steak with all the trimmings. My choice though was the Wild Mushroom Risotto with herbs and shaved Parmesan. This was one of the best I've had, just perfect and, at €14.00, good value also. 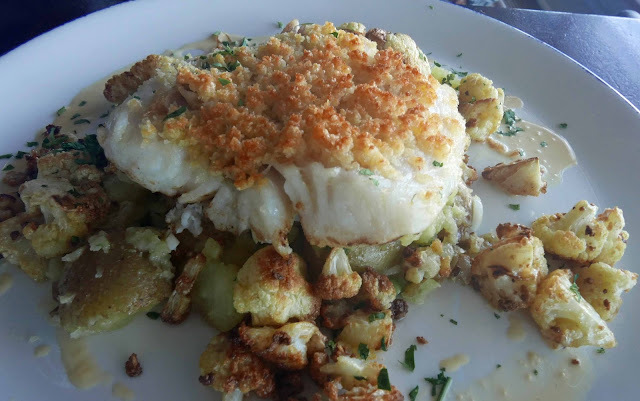 CL meanwhile also struck gold with her Cod with a Parmesan crust, baby potato, roast cauliflower, and wild garlic (no doubt from the local wood where we had earlier walked through swathes of it in flower). The fish was pristine, the whole dish a delicious combination of textures, flavours and aromas (19.95). Go for this if it is on when you visit!. We were tempted by the desserts but eventually decided to share the cheese board. 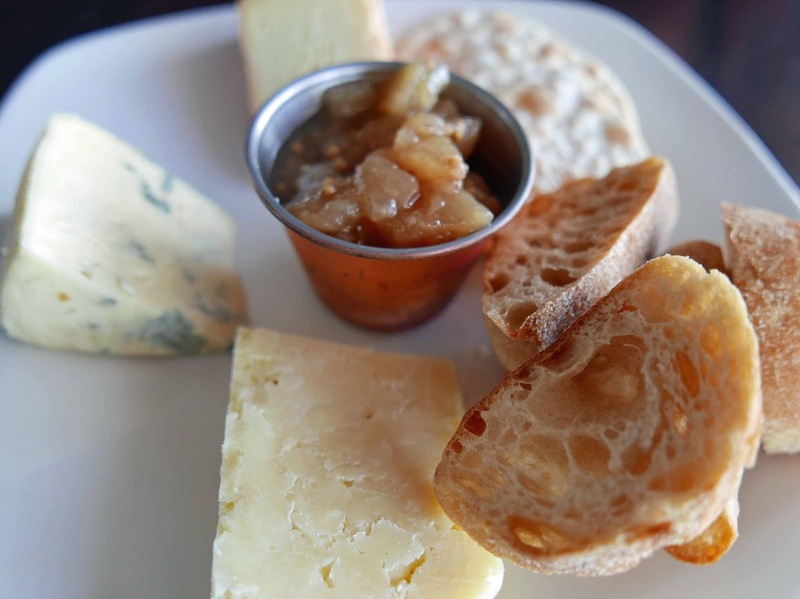 And we got a generous selection - Milleens, Hegarty’s Cheddar and Cashel Blue - served with an outstanding pear and fig chutney and plenty of bread and crackers. Another one to look out for! Probably not surprising that the offering is so good here. Both David and chef Martin have put in long years learning the trade in London and Dublin before settling in Courtmacsherry. 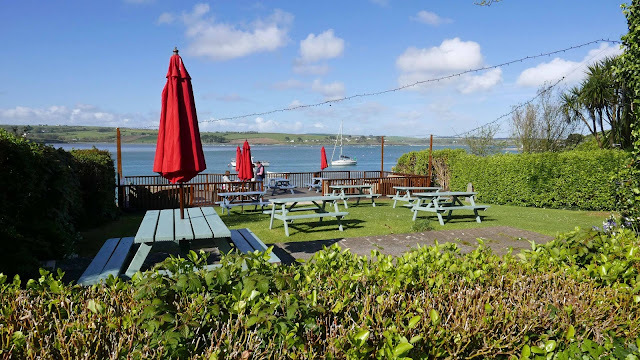 Their Gastro Pub is truly up and running and well worth a call, even if it is just for a glass of wine or beer on the terrace. While we were among just a few diners - we were in very early - it would be advisable to book ahead, especially if you are going down just for the meal as they tend to get full early on at the weekend. Out of the Blue. And only out of the blue! And only out of the blue! 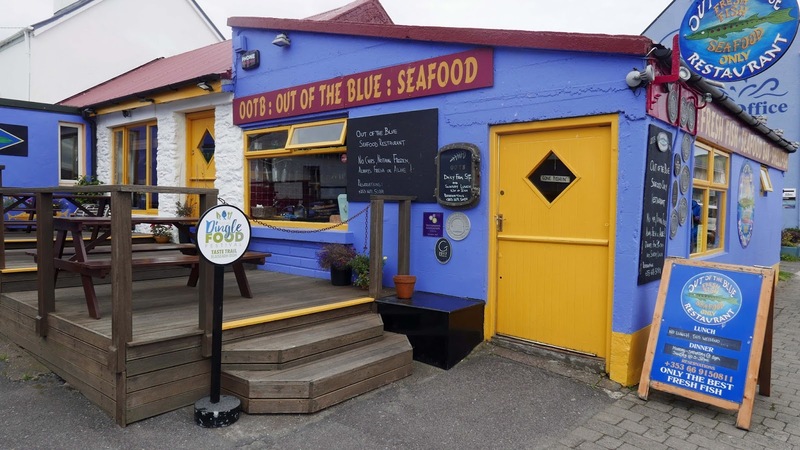 Out of the Blue, the restaurant with the colourful beach-hut style frontage on Dingle’s waterfront, is a fish restaurant. Nothing else. So, if there’s no fresh fish, there is no opening. They have a few sample menus on their tidy website but you won't know what is really on offer until you get there, indeed, they themselves profess not to know until the boats come in. So it is always something of a surprise, but never a let-down. Do book in advance though especially when there is a festival in town. We were there last weekend and reserved a table for Friday night, the night that the Food Festival launched. You don't get a menu in your hand. A large blackboard is positioned on a nearby chair and you are given plenty of time to consider the long list, everything from mussels to lobster, from pollack to black sole. 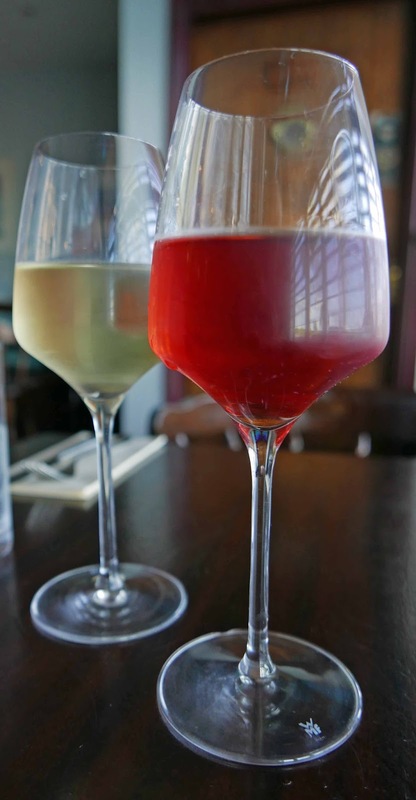 We made our choices as we sipped a glass of cool prosecco. If the outside looks like a hut, the inside is solid and comfortable, lots of paintings hanging there, including a lovely Currach by local artist Liam O'Neill. We had time to look around before the starters arrived. 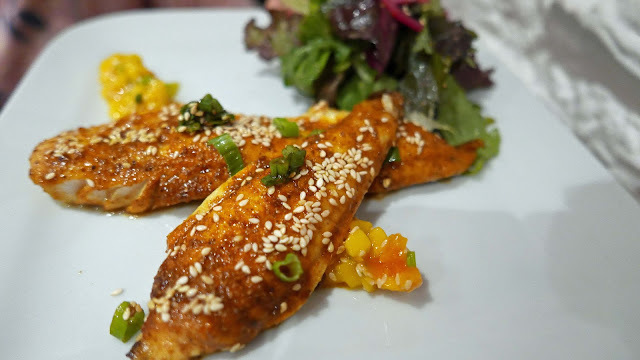 Pan fried curried plaice fillet with mango salsa was CL’s choice. 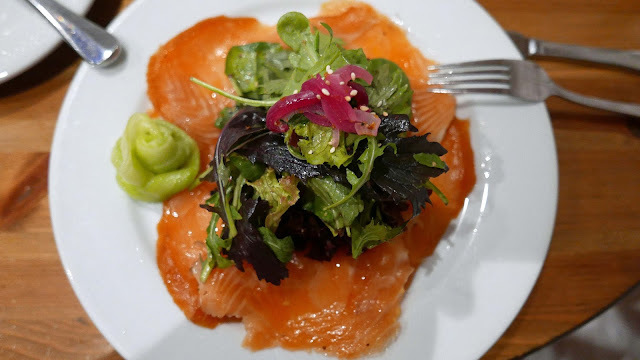 And mine was the Duo of home cured and smoked salmon with citrus dressing. Indeed, it was an agreed choice and we went half and half. Both were excellent, the salmon smooth and easy, the plaice enhanced by the mild curry treatment. Jean Marie Vaireaux has been chef here for the past ten years - he has been in Dingle for much longer - and we noticed that was demoing his Scallops flambéed with Calvados on the following day. We didn't pick that as a mains as we thought we’d catch him at St Jame’s Church, the demo venue for the festival. But we got side-tracked by the Taste Trail! Back to Out of the Blue and the mains, where there were many choices. Mine was the Char-grilled Halibut fillet with garlic butter. An excellent dish, superbly cooked and delivered to the table. I enjoyed that and CL was very happy indeed with her Pan fried Plaice fillet with Ratatouille Provençal, another simple dish, superbly executed. Oh, almost forgot, We have wine. The list is large enough to cover most tastes and the majority of the wines are European. Not a great fan of Picpoul de Pinet but the Cave L’Ormarine Preambule from the Languedoc could change my mind! Crisp, smooth, fruity, and mouth-watering, it proved an excellent match all through. 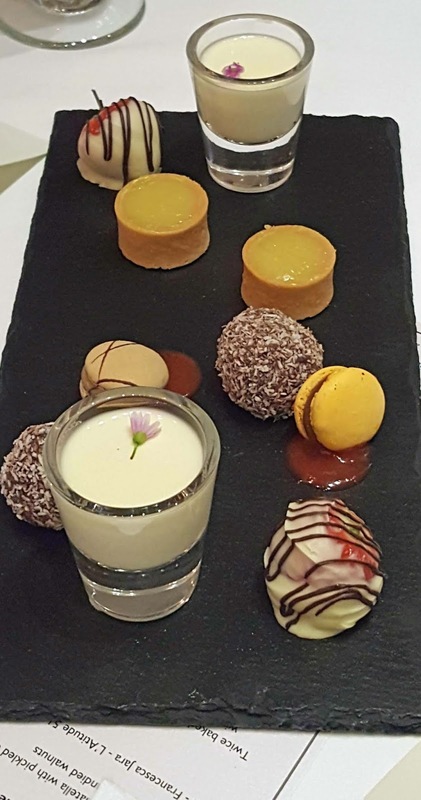 Dessert? Tempted yes, but in the end settled on a share of the cheese offering that featured Gubbeen and Crozier Blue and we finished off with that and a glass of port. Delicious end to a lovely evening and then a short stroll back to the hotel. Dingle Weather Or Which? Ignore Forecast. Just Go!